You wouldn't necessarily notice much in the US, except in ethnic neighbourhoods, but football fever is on. As in: soccer! Mostly you can tell because cars have started to sprout from their side windows these small flags, fluttering in the breeze, and indicating the country supported by the driver. As of this writing, it's early days in the 2014 World Cup tournament, so things are still relatively mellow. But as the final matches approach, the countries whose teams have made it to the semi-finals will suddenly break out in the national colours. In the Netherlands, everything turns an eye-watering orange, in one of those country-wide nods to the royal house originated by William of Orange. In Brazil, everything and everybody comes out green and yellow. 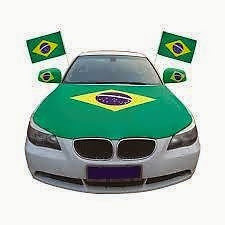 It's not just the toy cars that get outfitted like that: some people paint their actual cars with their flag, and wrap their side view mirrors in the national colours, and fly the flag from every available window. This tournament has so far been blessed with an uncommon number of goals. In a sport where you can usually be happy to see two or three goals, these World Cup games have seen five or more. It certainly makes for excitement. So enjoy the matches. As with any sport, they're better when you watch them with your friends. 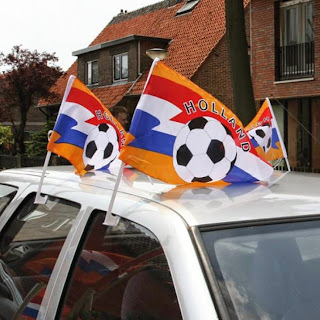 Not having a television, CelloDad and I have been going to the bar for lunch, to watch the Holland games. It's at least as much fun to watch the other fans in the place, as to actually watch the game! Sport the flags of your favourite team on your car. And get them off when it's over - in fact, try to avoid flying them on at highway speeds if you can: they do a number on your fuel efficiency. They're the most fun in the city, anyway, where fellow fans can hail you - and competitor supporters can fling insults.